The print industry never ceases to amaze us. 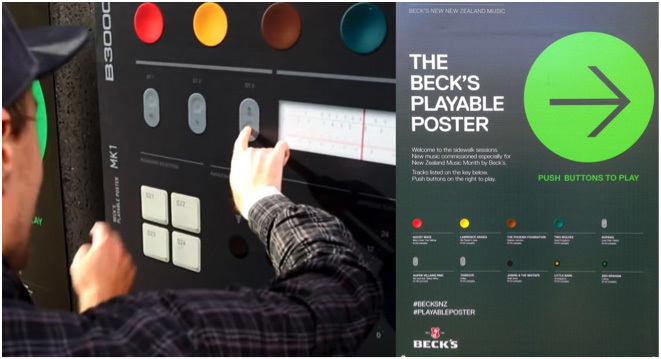 Using conductive ink, Beck’s were able to produce a series of interactive posters to entice users using promotional tracks. By simply touching a poster, users could remix the tracks – a feat which had previously been unattainable until the introduction of conductive ink. This type of ink, which is commercially available at quality poster printing services Sydney, is a recent development and is set to revolutionise the world of advertising. It contains silver nanoparticles which enable it to conduct electricity, and when connected to a processor, it can turn magazines and posters printed with the ink into a multisensory experience. When connected with various online platforms, conductive ink can transform any marketing campaign into a truly integrated multimedia experience. In a collaboration with New Zealand-based creative agency Shine, Beck’s aimed to increase awareness of emerging kiwi bands for promoting the New Zealand Music Month. They commissioned an award-winning UK technology company, Novalia, to facilitate the interactivity component of their posters. Users were encouraged to interact with the touch points on the poster – allowing them to select tracks to listen to and adding various other audio elements and sound effects to create their own remixes. This was achieved by printing the conductive ink on the reverse side of the posters which creates the touch sensors. By connecting the ink to an Apple-style processor, the poster registered electrical signals from user’s fingers, creating a touchscreen-like effect. Combining 20 touch points with an electric speaker attached to the rear of the poster, users could choose from 12 minutes of audio samples to experiment with. Technology such as this is sure to be a game-changer within the printing industry. For businesses based in Sydney, Absolute Colour poster printing services can provide similar marketing materials printed with conductive ink to engage and excite consumers. Conductive ink is considerably more affordable than many people realise, and can be printed on a wide range of substrates. This makes it an attractive marketing solution, able to be used a wide spectrum of media. In fact, rather than simply a passing trend, Business Wire UK have anticipated the conductive ink market to expand globally by 3.5% annually, turning media such as the Playable Poster into a $3.5 billion market by 2018.